A CMH lamp designed for horticulture because we don’t block the UV. The EYE HORTILUX CMH 315 grow lamp was designed specifically for horticulture. Most ceramic metal halide lamps were designed for use in the retail space, so the UV light was blocked. Hortilux uses a glass that allows the UV light to pass through benefiting plant growth. 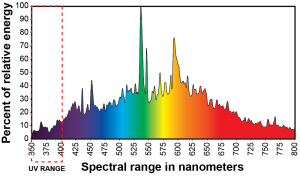 The exclusive EYE HORTILUX CMH spectrum provides 50% more Ultra Violet (UV) than the competitive lamps available today. This results in better overall plant growth and higher yields. 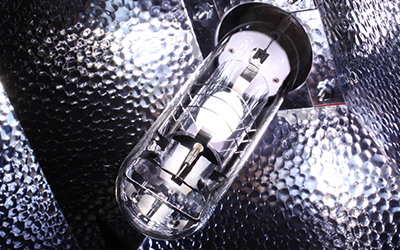 Traditionally, Ceramic Metal Halide lamps were not designed for horticulture applications. They were designed to block UV when lighting products in retail stores. The EYE HORTILUX CMH 315 Grow Lamp was engineered to allow safe amounts of UV to pass through the glass and better imitate a plant’s exposure to natural sunlight.